Colored paper of your choice. 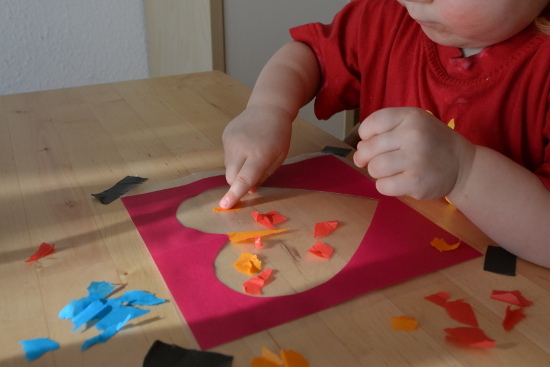 Cut a heart from colored paper. Tape a square of contact paper to the table sticky side up. Stick the part of the paper outside the heart cutout to the contact paper. 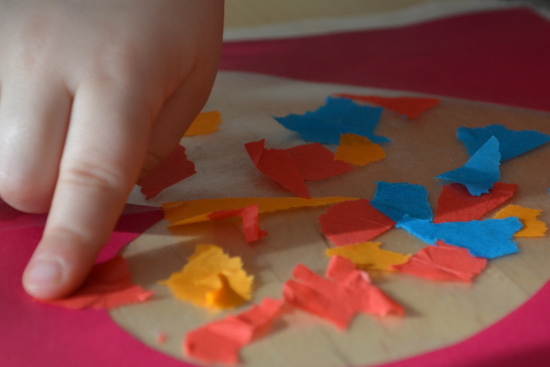 Tear or cut tissue paper into small pieces. Stick tissue paper pieces to the contact paper that is showing inside the heart cutout. Stick a second square of contact paper sticky side down on top of the first. Cut excess contact paper around the edges. Tape or hang in your window or in front of a lamp. I set this craft up at the table, and E was very interested right away. We’d never done anything with contact paper before, so she was surprised when I told her that she could stick little bits of paper to it. She tested it with her finger a few times before she was satisfied that the tissue paper would really stick to it, then started decorating. After she’d used the initial few pieces I’d torn up to get her started, I encouraged her to tear the paper herself, and she did but she wasn’t able to get them quite small enough for her liking, so she asked me to tear more pieces for her. I’d started with just one color to let E guide the way with what she wanted to do, and she asked for the other two colors. She was well aware without testing or me telling her that she could only stick the bits of paper to the clear area, not the paper-covered one. When half of one piece protruded into the non-sticky area, she tried to push it back. I left the finished heart taped to the table and stuck the second square of contact paper right on top of it. I went slowly and pulled the backing from the contact paper little by little. This way, it wasn’t too hard to avoid most bubbles, and I was able to reposition slightly when I didn’t get the contact paper in the proper spot once. After that, I just cut along the outside of the paper square, put some tape on the back of the finished Stained Glass Heart and put it in our window. It worked out great because it was a very sunny winter day, and the colors were really vibrant. When you tape the first piece of contact paper to the table, make sure there’s a little extra contact paper around the colored paper to stick your tape to, or roll up your tape and stick it to the underside of the contact paper. If you use the rest of the paper after cutting out the heart as I did, you have no room for error for your cut. 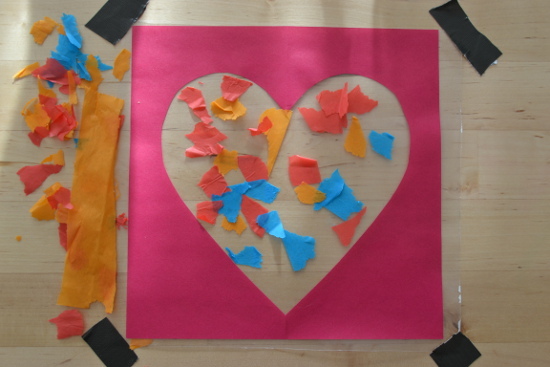 Alternatively, you can cut out a big heart and make a parallel cut one inch inside the heart for a heart-shaped frame. This way, you can adjust the big heart as needed, and you still have some wiggle room when cutting out the little one. That’s what Wee Folk Art did. 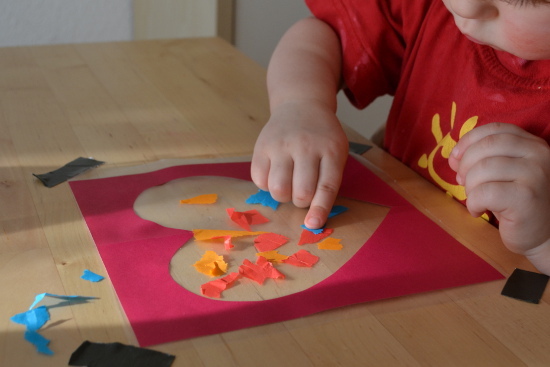 Your kid can tear or cut the pieces of tissue paper. As mentioned above, you can make a fully heart-shaped craft by using the inner cutout and making another cut about one inch inside the heart. 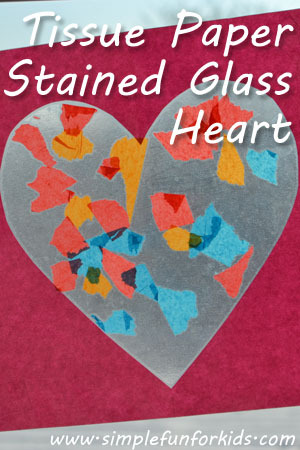 Or simply cut the finished Stained Glass Heart into the desired shape. Use transparent paper instead of tissue paper. Add some glitter and/or sequins. 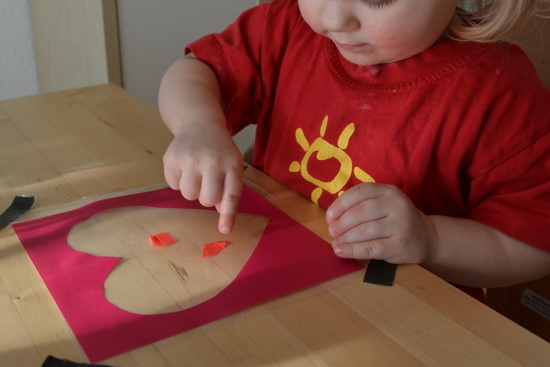 Cut little hearts or other shapes from tissue or transparent paper to stick on the contact paper. Use bits of string or felt for a different look. The basic idea: I saw this on Wee Folk Art, and knew just what to do when we had our first sunny day in weeks. 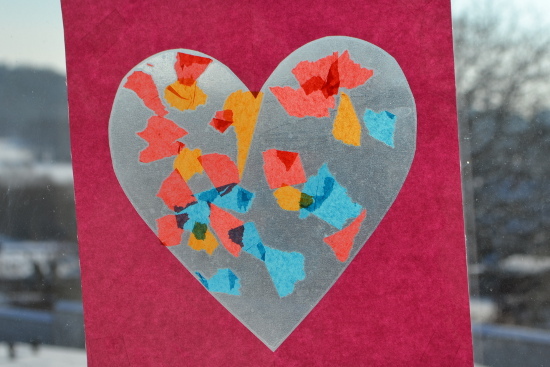 Have you made stained glass art with tissue paper? What’s your favorite way of making suncatchers? Tell me in the comments!